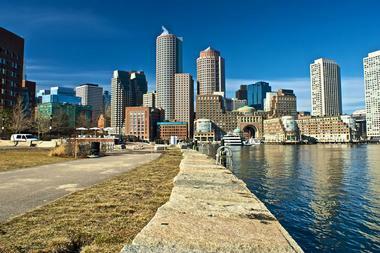 Visitors arrive in Boston all year long to explore all that this fascinating city offers. Winters can be quite cold, so a coat and a pair of boots will be necessary. The snow in winter varies from a small amount to heavy snow storms. The best time to visit Boston is between June and November. Summertime is quite busy with many visitors and hotel room rates can be high. But there are many things to see and do in the summer, like eating at sidewalk cafes, attending a concert, or watching a baseball game. Fall is a good time to visit because the weather is mild and visitors enjoy exploring Boston on foot. January is the coldest month in Boston with average high temperatures hitting 36°F (2°C) and average low temperatures dropping to 22°F (-5°C). Congruently, this month receives the largest amount of snowfall in the year with an average of 13 inches (33 cm). In February, the chill of winter remains but sees a slight climb in both average high and average low temperatures at 39°F (4°C) and 25°F (-4°C) respectively. The average snowfall also decreases to 11 inches (28 cm). March sees the upward rise continue with the arrival of Spring. The average high temperature hits 45°F (7°C), while the average low temperature hovers at 31°F (-1°C). Freezing evening temperatures contribute to the continual snowfall, which averages at 8 inches (28 cm) for the month of March. This month also sees the highest precipitation rate of the year at 4 inches (110 mm). Boston Weather in April: The last of the year’s snowfall comes in April as averages dwindle to 2 inches (5 cm). Temperatures remain chilly despite increase to an average high of 56°F (13°C) and an average low of 41°F (5°C). In May, the average high temperature makes a considerable jump to 66°F (19°C). The average low temperature is 50°F (10°C). June marks the beginning of summer. The change in season is reflected by the rise in average high and average low temperatures, which range between 76°F (24°C) and 60°F (15°C) respectively. July is the hottest month of the year, reaching an average high temperature of 81°F (27°C). It also receives the most sunshine in the year – 300 hours. Low temperatures average at 65°F (19°C). In August, the average high temperature goes down by one degree while the average low temperature remains the same. Boston Weather in September: Summer ends and fall arrives in September, bringing with it lower temperature averages. High temperatures average at 72°F (22°C). Meanwhile, low temperatures decrease to 57°F (14°C). October sees a steep drop in temperature as the fall season intensifies. Average high temperatures will only hit 61°F (16°C). Average low temperatures drop ten degrees to 47°F (8°C). In November, the average high temperature makes another significant decrease to 51°F (11°C). The snow starts falling again in November. The month receives the least amount of snowfall in the year, averaging at 1 inch (3 cm). The low temperature average is 38°F (3°C). December sees a huge jump in snowfall with the month’s averages hitting 9 inches (23 cm). Coincidentally, the month also sees the least amount of sunshine in the year – 148 hours. The average high and average low temperatures range between 41°F (5°C) and 28°F (-2°C). Weather wise, the best time to travel to Massachusetts is during the spring months of April through June or between the late summer and early fall months of September and October. The best time to journey to Massachusetts to see the glorious fall foliage is late in October, when the leaves have turned and autumn truly settles in. For those who are headed to Massachusetts to experience Cape Cod, the best months to head over are April, May, October or November. 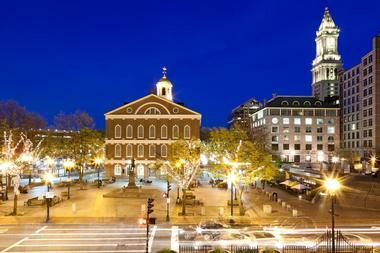 Visitors arrive in Boston all year long to explore all that this fascinating city offers. Winters can be quite cold, so a coat and a pair of boots will be necessary: the snow in winter varies from a small amount to heavy snow storms. The best time to visit is between June and November. Summertime is quite busy with many visitors and hotel room rates can be high. But there are many things to see and do in the summer, like eating at sidewalk cafes, attending a concert, or watching a baseball game. Fall is a good time to visit because the weather is mild and visitors enjoy exploring Boston on foot. 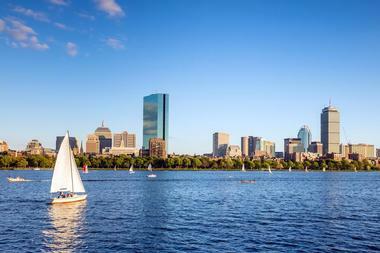 Read more: 50 Best Things to Do in Boston, Massachusetts. 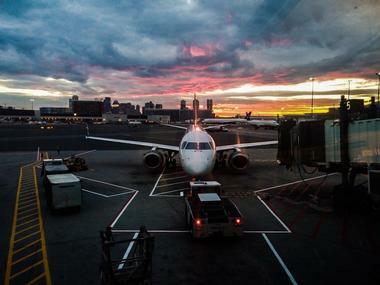 Boston’s Logan Airport is the largest airport in New England. Approximately 40 national and international airlines fly in and out of this airport: its four terminals have recently been renovated. It is located a mere two miles from downtown Boston. For people who prefer traveling by train over flying, Amtrak has service with three stops in Boston: this service connects the city with New York, Washington, DC, Philadelphia, and Portland, Maine. There are two bus companies that serve Boston: they are Greyhound and Peter Pan. Both of these stop downtown. 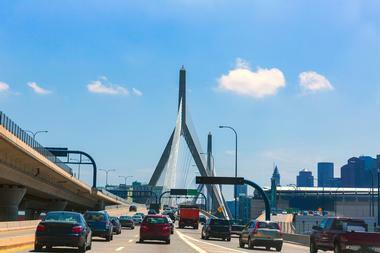 Arriving by car is easy as there are three major highways into Boston: I-90, I-95, and I-93. 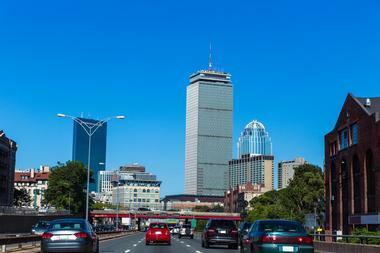 Because Boston’s Logan Airport is so close to downtown, it is very easy to get from the airport into the city. There are several options available to visitors. Boston’s Massachusetts By Transportation Authority (MBTA) offers two subway lines that connect the airport with the city: these are the Blue Line Subway and the Silver Line Bus Rapid Transit service. Boston’s MBTA also offers another public transport option which is fun and interesting: there are commuter boats that take visitors from the airport to several places along Boston’s waterfront. There are also shared vans, taxis, and limousines that take visitors into the city. 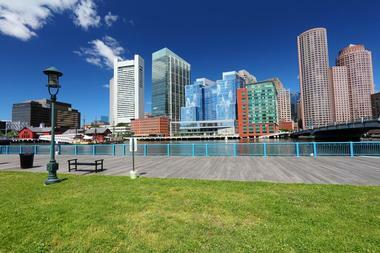 Boston has an unusually large number of visitor centers spread in and around the city. The Greater Boston Convention and Visitors Bureau is one of the most helpful of these: it offers a visitor information kit that includes a guide book, a map, a travel planner, and information about discounts for attractions, events, nightlife, restaurants, shopping, and much more. The bureau also offers a guide specifically geared towards children. Another visitor information center is conveniently located on Boston Common, a popular tourist area. In Cambridge, the Cambridge Office for Tourism has a tourist information kiosk right in the center of Harvard Square. 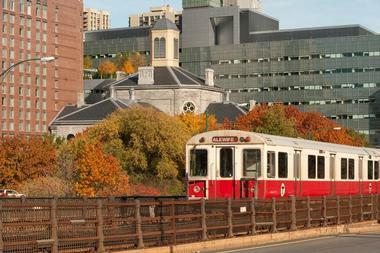 There are many ways to get around Boston, but taking the “T” is one of the best ways. It is a public transportation system that is operated by the Massachusetts Bay Transportation Authority (MBTA): the system includes buses, ferries, trains, and trolleys. Of all of these, the subway is by far the most efficient way to get around the city. There are individual fares as well as a reloadable “CharlieCard” which makes the fares a bit less expensive. Combining the subway with trolleys makes it very easy to explore Boston. There are many bus routes in the city and to the suburbs. MBTA’s Inner Harbor ferry is another fun way to get around. 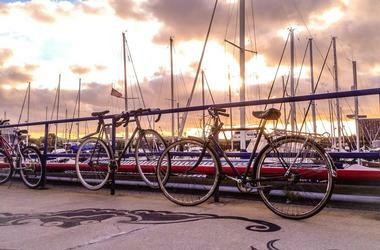 Exploring Boston by riding a bike can be fun and easy. The city has a program called “Boston Bikes” that helps to make the city a safe and inviting place for cyclists, both residents and visitors. There are many bicycle lanes and paths throughout the city and the city is committed to improving safety. Community bike programs help cyclists through education about safety and access to bikes. There is a bike sharing system called the New Balance Hubway Bike-Share System. After signing up for the program, cyclists are given a key: they insert this key into any bike “dock” where the cyclist can use the bike and then return it to any dock. 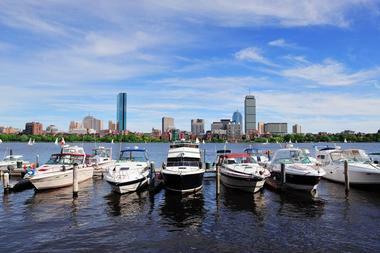 The other ways to get around Boston include walking, taxi, water taxi, and by car. Many people get around the city on foot: this is one of the best ways to explore Boston which calls itself a walking city. Many of the main attractions are within walking distance from each other, and the city streets are easy to navigate. There are plenty of taxis in Boston: they are not the least expensive choice, and passengers must pay for tolls including the tunnel toll. Water taxis are fun, but they can be quite expensive. 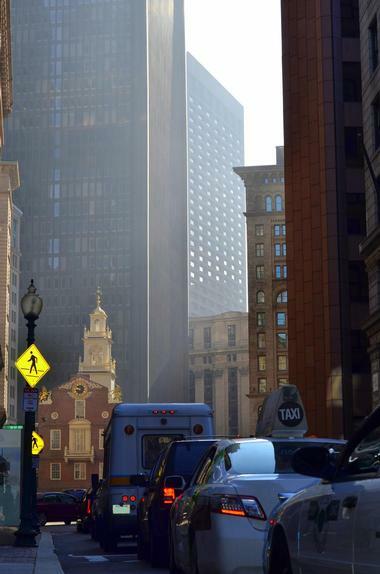 Using a car in Boston can be difficult because many of the streets are narrow and there are not many parking spaces. 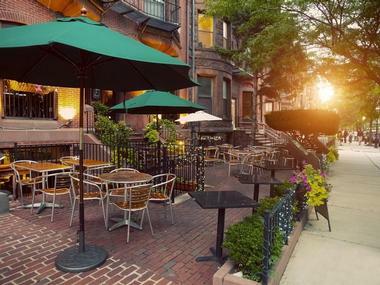 Boston offers a rich variety of options for eating out. Seafood restaurants are popular dining destinations: the best dishes are clam chowder and New England lobsters. Contemporary cuisine and traditional New England fare are popular in Boston. In warm weather, many restaurants offer fresh local produce on their menus. Many of the hotels in Boston offer huge Sunday brunches. Celebrity chefs create dishes at fine dining restaurants, while students and visitors on a budget will find inexpensive meals at one of the many ethnic restaurants in Boston. Some of the many ethnic cuisines in the city are Chinese, French, Italian, Middle Eastern, Thai, and many more. Shopping is one of the main reasons that visitors choose Boston as a destination. Shopping is even more popular in Boston than activities such as going to museums. There are many different types of shopping experiences awaiting visitors. In Boston and Cambridge, there are huge malls, little boutiques, many bookstores, outlets, galleries, and national chain stores. There is no sales tax on food items or on articles of clothing that cost less than $175.00. The best shopping area is Boston’s Back Bay: here there are boutiques, upscale galleries, and shops on Newbury Street that make this shopping area a world-famous destination. Faneuil Hall Marketplace is another popular place to shop. Boston consists of many neighborhoods. Downtown is made up of six different neighborhoods starting with The Waterfront with its condos, hotels, offices, marinas, and restaurants. The North End is one of downtown’s oldest neighborhoods. There are many Italians who live in this area, as well as workers who walk to the nearby financial district. North Station is known for the TD Garden arena and its restaurants and nightspots. 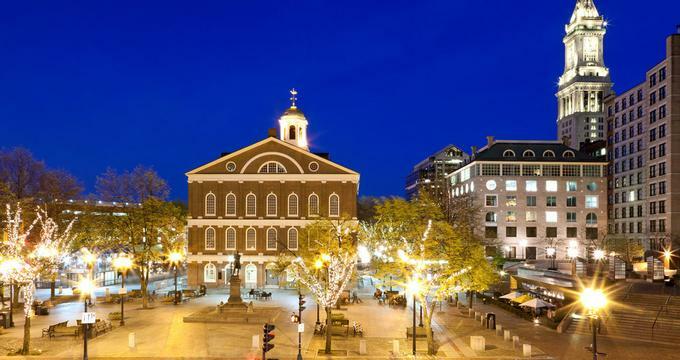 Faneuil Hall Marketplace is by far the most popular area for visitors because of its old restored buildings, bars, restaurants, and shops. Beacon Hill is known for its tree-lined streets, architectural gems, and its brick and cobblestone alleys. 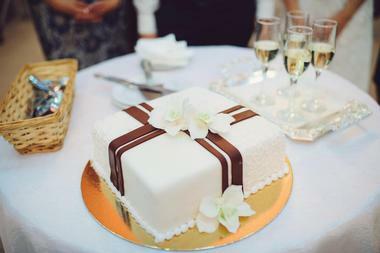 Boston is a popular place for weddings because of its many venues. A Massachusetts marriage license must be obtained: out-of-state licenses cannot be used in Massachusetts. Many couples choose hotels, and Boston has many hotel venues. One of these is the Fairmont Copley Plaza, a luxury downtown hotel built in 1912 and now a landmark. Other hotels include the Hawthorne Hotel on the Common, the Hyatt Regency Boston Harbor, the Langham, and the Sheraton Commander Hotel. Other kinds of wedding venues include country clubs such as the International Golf Club and Resort, restaurants like Serafina Boston, open air gardens such as 9OFS, and historic houses like the Omni Parker House. There is a wide variety of accommodations in Boston. Many hotels are located in the downtown area: this is a good option because this area of Boston is small and convenient for sightseeing. Room rates are generally high in the downtown area. Some hotels are in historic old properties while others are new buildings in a contemporary style; room sizes range from tiny to very large. In addition to traditional luxury hotels, there are also small boutique hotels, bed and breakfasts, and family and budget-friendly hotels. Some people choose to stay in one of the many neighborhoods: Cambridge is a popular choice.